This past weekend was great both from a relaxing and racing point of view. It was good to get some beach time and it was good to get back into racing after a few weeks training. 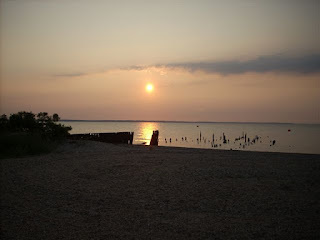 Colonial Beach is only about 70miles from Bowie and so the drive down on Friday night was pretty effortless and we made it down in time to have a few drinks while overlooking the beach. Saturday was a lie-in day for me....with not needing to get up for a long bike ride it was nice to have a leisurely breakfast with Sarah. I did however, get out for an hour and pre-ride the bike course to prepare for the race. The rest of Saturday was total relaxation....the hotel was on the beach front and so we just did a bit of sunbathing, grabbed some lunch and had a short wander around town. Fortunately, the hotel was just across the road (literally) from transition/registration and so that was done within a few minutes. The rest of the afternoon was back to the beach to catch some rays! In the evening, we headed out to the Point and chilled out over dinner, making sure to check the run course on the way back to the hotel. 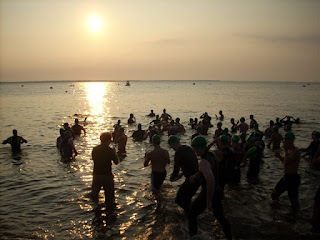 The race start on Sunday was at 6:50am and we leisurely made it over to transition at 6:15am and prepped for the start. The swim was only 1,000 meters and I wasn't sure whether I wanted to wear the wetsuit...the water was warm but somehow they managed to find an area where it was below 78 degrees! In the end I decided to go with the suit even if it would make for a slightly longer T1 time. After about 3 minutes of the swim I realised that I probably didn't need the suit and before long we were out of water....only 11mins 28secs for a 1,000 meter swim makes me think that the course was more like 750 meters! I was in 24th place and a lot of ground to make up over the "fish" in front. Having pre-ridden the course the day before I knew that the start and finish were dead flat with the middle section being a bit lumpy. I also knew that after a heavy training period and most of it being long-distance work, the speed may not be there. Although I averaged 24MPH on the bike I felt a bit sluggish on the flats but strong on the hills and only made up a few places. 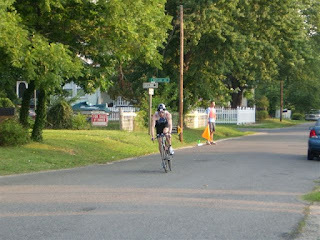 I had the 16th fastest bike split and coming back into T2 I was in 14th place overall. To get into the top ten I needed a good run and had 6 miles in which to try and run people down. I started well, the legs felt good and I was quickly getting amongst the racers ahead of me. I managed to crank out sub 6-min miles for the whole course and ended with the 3rd fastest run of the day at 34mins 57secs at 5:50min/miles. I was well pleased with that and had caught six people on the run to finish in 8th at 1hr 50mins. 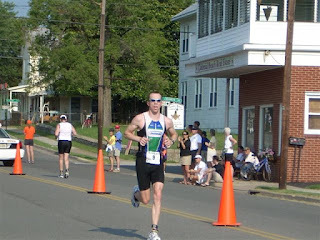 Unfortunately I was 26secs out of 1st in Age Group and ended in 2nd AG. The overall winner did 1hr 46mins, so I was 4mins off the front, which was primarily due to the time lost on the bike section. 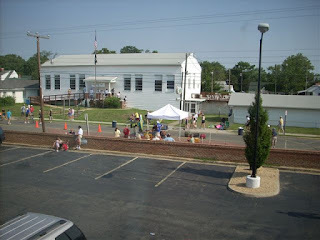 Overall the race was good, they had good food afterwards (hmmm blueberry cake glazed donuts) and even beer! The hotel was so close that we didn't have to use the porta-pottys and even had time for a shower after the race and before the awards! The best thing was that the results and awards were sharp and the whole race was done and dusted by 11:30am! It enabled Sarah and I to have a Sunday drive back through Southern Maryland taking in a few small towns and avoiding the major highways....perfect for a sunny summer Sunday afternoon and the end of a great weekend. The race finish from the hotel room! The only troublesome thing of the weekend was the lack of zip in the legs on the bike course. This is the 2nd race in a row that I didn't feel "it" on the bike and this is despite much more time spent riding this season.....anyone got any ideas?! It's not that I feel tired as I do feel strong, it's just that I don't feel the speed. I think I probably need to do more threshold and interval work and hopefully that should do the trick. A plus point this season however, is that the increased time on the bike has enabled me to feel stronger coming into the run and that has shown in the results with much faster run splits than in seasons previous. All in all some things to work on as we come into the final two months before ChesapeakeMan and the main goal for the rest of the season....getting in under 10hours for 140.6m!